12/21/2007 ". . . LIKE A BOX OF CHOCOLATES!" ANOTHER YEAR DRAWS TO A CLOSE. THE HOLIDAY SEASON IS UPON US. A GOOD OPPORTUNITY TO THANK ALL THOSE WHO MADE THIS YEAR A SPECIAL ONE FOR ME AND BEYOND THE FIELDS. A BIG THANKS TO ALL THOSE WHO CAME TO SEE US, TO ALL THOSE WHO TOOK THE TIME TO WRITE US, AND TO ALL THOSE WHO GRACIOUSLY LENT US THEIR MUSICAL TALENTS. IT WAS A SPECIAL YEAR INDEED. WE WORKED WITH THREE DIFFERENT DRUMMERS, THREE DIFFERENT BASS PLAYERS, AND WE NEVER DID MORE THAN TWO SHOWS WITH THE SAME LINE-UP. COMING TO SEE US IN 2007 REALLY WAS LIKE THAT PROVERBIAL BOX OF CHOCOLATES, YOU NEVER KNEW WHAT YOU WERE GOING TO GET. IT WAS SPECIAL EVERY NIGHT, DIFFERENT EVERY NIGHT, AND ALL THE MORE FUN BECAUSE OF IT. OUR RIDICULOUSLY OVERDUE NEW CD WILL REMAIN RIDICULOUSLY OVERDUE FOR A LITTLE WHILE LONGER, I'M AFRAID. 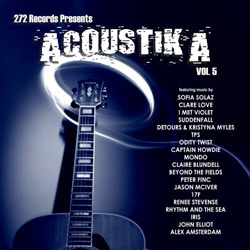 THE ONLY NEW CD CONTAINING MUSIC BY BEYOND THE FIELDS IS "ACOUSTIKA VOL. 5", A COMPILATION RELEASED BY HOLLYWOOD-BASED LABEL 272 RECORDS. NO NEED TO GO OUT AND BUY IT, THOUGH, AT LEAST NOT BECAUSE OF OUR CONTRIBUTION. IT JUST CONTAINS THE ACOUSTIC LIVE RECORDING OF THE ARTIST'S SONG, THE ONE FROM THE LION. SPEAKING OF ACOUSTIC RECORDINGS, HERE'S THIS YEAR'S TRADITIONAL CHRISTMAS PRESENT FROM US. THE CANTERBURY TALES PART III: ALIVE AGAIN, RECORDED AT THE LION IN WINTER 2005. HOPE YOU LIKE IT. MAY ALL YOUR DREAMS COME TRUE IN 2008 . . . AND SOME MORE . . .
"THEN THE DORMOUSE SHALL! " 04/06/2007 HAPPY EASTER YOU ALL! I HOPE THE NEW YEAR HAS BEEN GOOD TO YOU SO FAR. MYSELF, I'M STILL STRUGGLING TO GET ANYTHING DONE AT ALL. YES, I STILL HAVE TWO JOBS, AND IT STILL TAKES ME UP TO FOUR HOURS AND MORE TO GET TO WORK AND BACK. BE THAT AS IT MAY, I'M HAPPY TO ANNOUNCE NEW ACOUSTIC PERFORMANCES. THAT'S RIGHT. THE LAST ONE IS PART OF AN ANNUAL CULTURAL WEEK. THE CONCERT TAKES PLACE IN FRONT OF THE HISTORICAL TOWN HALL. ADMISSION IS 5 SWISS FRANCS (YES, FIVE!). ANY NEWS ON THE ALBUM? NO, NOT REALLY. WE HOPE TO RECORD AGAIN SOON, BUT WE'RE STILL LOOKING FOR TIME.